What Will Happen to the U.S. Textile and Apparel Industry if NAFTA Is Gone? Since its taking effect in 1995, NAFTA, a trade deal between the United States, Mexico, and Canada, has raised heated debate regarding its impact on the U.S. economy. President Trump has repeatedly derided NAFTA, describing it as “very, very bad” for U.S. companies and workers, and he promised during his campaign that he would remove the United States from the trade agreement if he could not negotiate improvements. The U.S. textile and apparel (T&A) industry is a critical stakeholder of the potential policy change, because of its deep involvement in the regional T&A supply chain established by the NAFTA. Particularly, over the past decades, trade creation effect of the NAFTA has significantly facilitated the formation of a regional T&A supply chain among its members. Within this supply chain, the United States typically exports textiles to Mexico, which turns imported yarns and fabrics into apparel and then exports finished apparel back to the United and Canada for consumption. 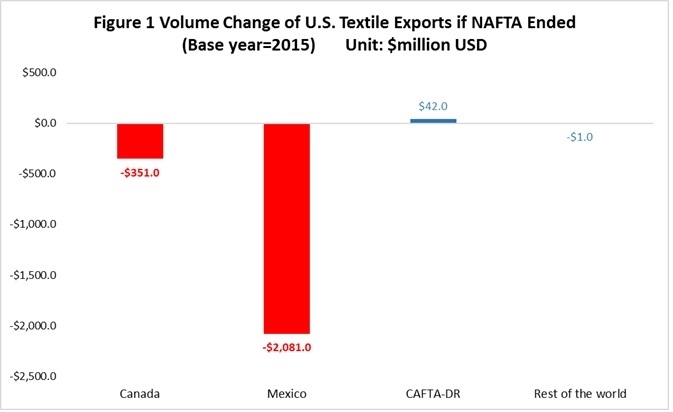 First, results show that ending the NAFTA will significantly hurt U.S. textile exports. Specifically, the annual U.S. textile exports to Mexico and Canada will sharply decline by $2,081 million (down 47.7%) and $351 million (down 14%) respectively compared to the base year level in 2015.Although U.S. textile exports to other members of the Central America Free Trade Agreement (CAFTA-DR), will slightly increase by $42 million (up 1.5%), the potential gains will be far less than the loss of exports to the NAFTA region. Second, results show that ending the NAFTA will significantly reduce U.S. apparel imports from the NAFTA region. Specifically, annual U.S. apparel imports from Mexico and Canada will sharply decrease by $1,610 million (down 45.3%) and $916 million (down 154.2%) respectively compared to the base year level in 2015 (H2 is supported). 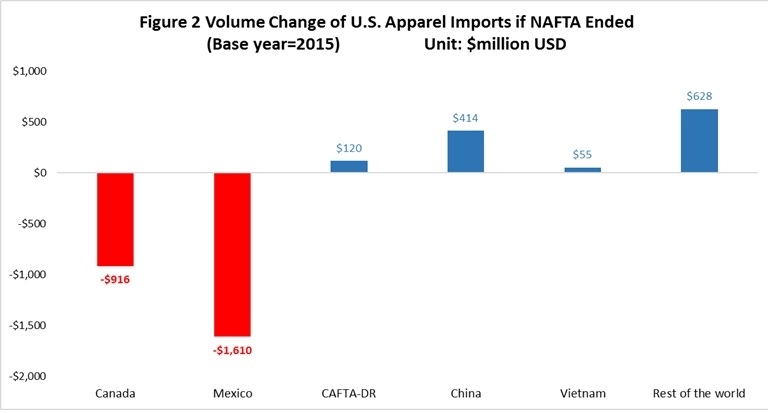 However, ending the NAFTA would do little to curb the total U.S. apparel imports, largely because U.S. companies will simply switch to importing more apparel from other suppliers such as China and Vietnam. Third, ending NAFTA will further undercut textile and apparel manufacturing in the United States rather than bring back “Made in the USA.” Specifically, annual U.S. textile and apparel manufacturing will decline by $1,923 million (down 12.8%) and $308 million (down 3.0%) respectively compared to the base year level in 2015 (H3 is supported). Weaker demand from the NAFTA region is the primary reason why U.S. T&A manufacturing will suffer a decline. These findings have several important implications. On the one hand, the results suggest that the U.S. T&A will be a big loser if the NAFTA no longer exists. Particularly, ending the agreement will put the regional T&A supply chain in jeopardy and make the U.S. textile industry lose its single largest export market—Mexico. On the other hand, findings of the study confirm that in an almost perfectly competitive market like apparel, raising tariff rate is bound to result in trade diversion. With so many alternative suppliers out there, understandably, ending the NAFTA will NOT increase demand for T&A “Made in the USA,” nor create more manufacturing jobs in the sector. Rather, Asian textile and apparel suppliers will take away market shares from Mexico and ironically benefit most from NAFTA’s dismantlement. *Note: The study is based on the computable general equilibrium (CGE) model developed by the Global Trade Analysis Project (GTAP). Data of the analysis came from the latest GTAP9 database, which includes trade and production data of 57 sectors in 140 countries in 2015 as the base year. For the purpose of the study, we assume that if NAFTA no longer exists, the tariff rate applied for T&A traded between NAFTA members will increase from zero to the normal duty rate (i.e. the Most-Favored-Nation duty rate) in respective countries. Switching the sourcing base to central america is potentially a short term strategy, until US apparel brands find more viable sourcing options in the long run. Assuming NAFTA re-negotiations will significantly impact T&A exports to Mexico; can central america expand the production capacity ? Thank you for the great comments! 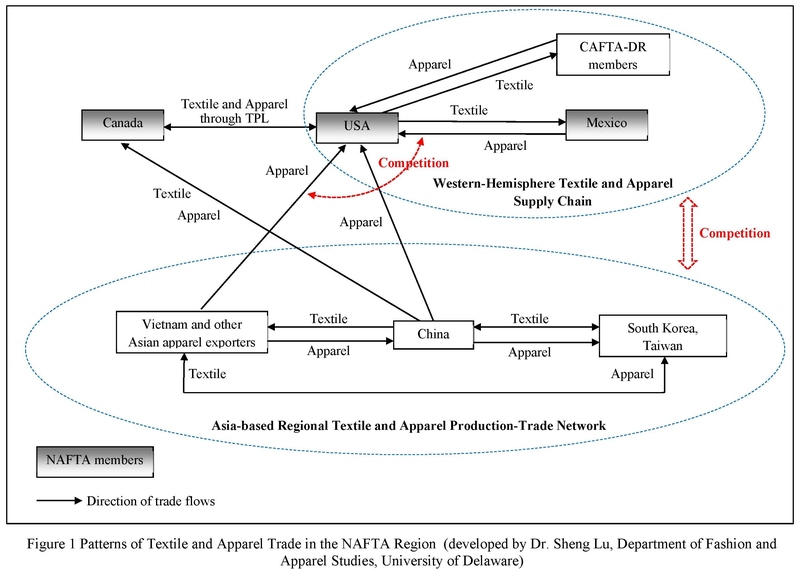 I think apparel exporters from the CAFTA-DR region may benefit if US pulls out of NAFTA. Fashion brands and retailers are giving more weight to “speed to market” in their sourcing decisions. I am not optimistic about apparel “made in the USA” however. Because like you said, it is more than just about apparel factories, but how to recreate a whole supply chain, which is unlikely to happen in large scale. Regarding Asia, Vietnam and Bangladesh should continue to grow their market shares slowly but steadily. But I don’t think this is because “Made in China” is losing competitiveness. Rather, it reflects the on-going industry upgrading in the Asia-based T&A supply chain. I found this to be very interesting. I knew that NAFTA was a positive thing for the parties involved and that it helps get products quicker to the consumer compared to extending the supply chain in to Asia-Pacific, but I did not realize how much of an impact taking it away would make. According to the above charts, US textiles would decline 47.7%! That is a significant amount, which would hurt the industry greatly. And while imports would increase for other parties not in NAFTA, the amount it would increase is no where near the amount it would decrease in the NAFTA parties. As stated above, with so many alternative suppliers out there, understandably, ending the NAFTA will not increase demand for T&A “Made in the USA,” nor create more manufacturing jobs in the sector. Rather, Asian textile and apparel suppliers will take away market shares from Mexico and ironically benefit most from NAFTA’s dismantlement. As of recently, President Trump said the US will not pull out of NAFTA after all. Even though President Trump has been quoted by saying that it was the “worst trade deal” he changed his mind and said he will renegotiate and that sticking it out will “make all three countries stronger and better”. Maybe, this is a result of findings that are demonstrated above? Great comments! I wish, but don’t think Trump changed his mind because of this study However, it is critical to evaluate the impact of NAFTA from the supply chain perspective. International trade is NOT a zero-sum game, especially in the 21st century. Countries share common interests through a collaborative production network. I hope trade policy can reflect the nature of textile and apparel trade today. It is clear that getting rid of NAFTA for the U.S. will have detrimental outcomes. The third chart shows that U.S. textile and apparel manufacturing will decline $1,923 million and $308 million compared to 2015. The U.S. T&A will decline drastically which will clearly hurt us. I’m confused to why President Trump thinks that this solution is the best one for America and the American people. Like we discussed in class Americans want their jobs back and President Trump agrees with that. However we also discussed that trade is inevitable nowadays and it actually helps rather than hurts us in many ways. From these numbers and charts I’m curious to know what President Trump thinks the outcome will be as well as what his plan is. If we’re no longer apart of NAFTA there needs to be a substitute…what will that be? Ending NAFTA seems to be extremely detrimental to the U.S. textile industry specifically. 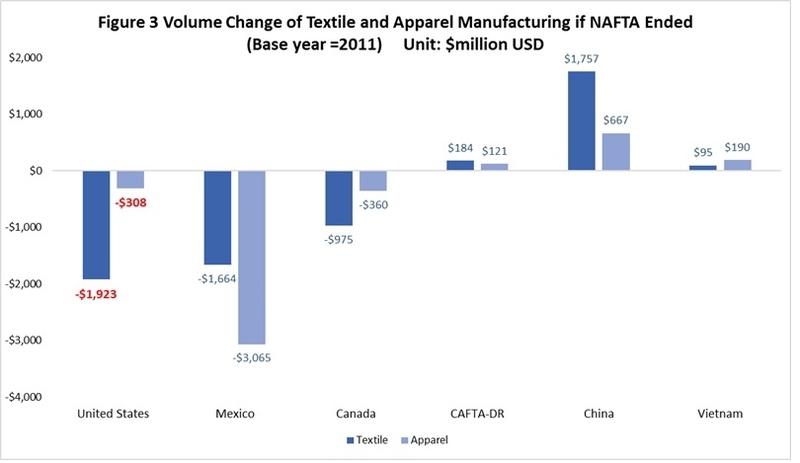 In the first chart, textile exports to Mexico will decrease by $1,610 million. Pulling out of this deal could significantly hurt Mexico’s economy. Considering Mexico is a border country to the U.S., shouldn’t we as a country not do anything drastic that would tank the economic structure of the country? The proximity of Mexico to the U.S. worries me, because a part of our economy could be affected due to the proximity of Mexico. The same general idea goes for Canada, although the affects for Canada are far less drastic than Mexico. The U.S. retail industry is reliant on Mexico for goods and services that they wish to have a shorter lead time with. Specifically, fast fashion items. I can’t imagine that U.S. retailers would want NAFTA to not be a trade deal anymore. Also quite interesting is that most US apparel imports from Mexico are “basic items” such as men & boy’s cotton trousers and men & boy’s cotton knitted shirt. This suggests that US fashion retailers/brands may quickly switch to source from elsewhere should the duty saving benefits under NAFTA are no longer available. Ending NAFTA will have serious consequences for the U.S. textile industry. I was not aware of how large an impact getting rid of NAFTA would have. According to figure 3 the U.S. textile volume and apparel manufacturing would decrease substantially which is very alarming to see given that Trump has said that NAFTA is the worst trade deals and that its “very, very bad” for U.S. companies and workers. It seems that he is head strong on getting rid of NAFTA after he promised during his campaign if he could not negotiate improvements. Overall it seems like withdrawing from NAFTA could be very harmful to the US Textile and Apparel industry. Textile exports to Mexico and Canada will decrease by $2,081 million (down 47.7%), exports especially to Mexico will decrease by $1,610 million. Pulling out of this deal could significantly hurt Mexico’s economy. One point that has been a important part in Trumps campaign is bringing back jobs in America however, according to the article withdrawing from NAFTA because there won’t be a demand for American manufacturing. What’s your view on the NAFTA renegotiation? Do you agree with the findings of this study? How do you think the T&A chapter under the NAFTA can be updated in the renegotiation? As we can see from this article, removing the U.S. from NAFTA would be extremely detrimental to our country, as well as Mexico and Canada who rely on America as much as we rely on them. The first chart shows that ending NAFTA would be harmful to U.S. textile exports and would decline by $2,081 million, hurting Mexico and Canada as well. Similarly, the second chart displays the decline of $1,610 million in exports from Mexico and Canada. Thirdly, we can see that by removing the U.S. from NAFTA, President Trump is only decreasing the amount of textile and apparel manufacturing happening in America. President Trump is all for “Making America Great Again”, but based on these charts and statistics, he’s actually making America worse. I’m confused as to why he thinks removing America from NAFTA would have a positive impact on the country. By doing this, President Trump is only making Asian textile and apparel manufacturers stronger since they will benefit from market shares from Mexico. If President Trump wants to bring jobs back to America, shouldn’t he come up with a more successful plan, since it is clear that removing the U.S. from NAFTA is not fixing the employment rate? The U.S. relies on Mexico for cheaper and faster fashion items, so it worries me that removing America from NAFTA would severely hurt Mexico’s economy, which in turn could have a negative impact on ours as well. This was a very interesting article to read, and it was a relief to find out that President Trump has now decided to negotiate NAFTA instead of terminating it all together. I think that most people are uneducated about how mechanizes the textile industry is now in the U.S which is main reason for why there have been job loss in that industry over the past decade. Furthermore, if the U.S eliminates NAFTA all together there will no loner be incentive for U.S companies to use the western supply chain. This is turn will lead to a major increase in imports coming from other countries that offer cheaper labor. It will not only impact our T&A imports but it will extremely hurt our T&A exports, which will in turn hurt our manufacturing and could lead to major jobs lost. It is important that every country benefit in a trade agreement, but this trade agreement has help the U.S textile industry to grow, it would be in the best interests of the U.S to renegotiate and update the FTA and not eliminated it altogether. It is very shocking that after reading this article and its findings, that Trump would want to withdraw from NAFTA, seeing as though it could have very harmful effects for the U.S. and the T&A industry. According to the charts, textiles exports would decrease by 47.7% if we backed out of NAFTA mainly because Mexico is one of our biggest export destinations for textiles! This is such a significant amount and would do a lot of harm for the industry. Many companies would find else where such as China or Vietnam to source their products rather than bringing them back to the US and wouldn’t hurt our imports. Instead of trying to help create jobs and help America, Trump isn’t making “Made in the USA” any more appealing or possible for manufacturings or consumers. It is very disappointing to think that backing out of such a long term agreement will not only hurt our T&A industry, but won’t solve the problem Trump is trying to fix. But why President Trump and his supporters “hate” NAFTA? I think that overall, getting rid of NAFTA will have horrible outcomes for the U.S. The third chart shows that U.S. textile and apparel manufacturing will decline $1,923 million and $308 million. I think Trump is doing the wrong thing here and I’m not sure why he thinks this is a good idea for the American people. Trump wants to get jobs back to the US and so do many Americans. However we’ve been learning in class that trade will happen either way and that in many cases, it helps us. I’m excited to see what happens from here and to see if Trump will have another plan put in place and if that will do any good for the American people. Ending NAFTA will crub the importing apparel from Mexico and Canada of the United States, and increase the importing from China and Veitnam. However, almost all of the apparel in the country is imported from China, and this action will just make the country has more importing conversation with asia countries. Overall, the US withdrawing from NAFTA would hurt the apparel and textile industry. It would cause a huge problem with textile exports down to 47.7%. The apparel and textile manufacturing alone in the US is projected to decline from $1,923 million to $308 million, a huge, detrimental drop. NAFTA, although arguable that it hurts US companies and employment, can also be argued that it is more beneficial for certain companies and its consumers due to cheaper costs and quicker results. All in all, NAFTA may have its flaws, but every agreement does, and we need to be more mindful with how this potential withdrawal will effect our country in the long run. Ending NAFTA will significantly harm the U.S. “The United States typically exports textiles to Mexico, which turns imported yarns and fabrics into apparel and then exports finished apparel back to the United and Canada for consumption.” By ending NAFTA, President Trump hopes to bring back jobs to the U.S. and make goods be labeled “Made in the U.S.” again, but he is not thinking about the negatives that come with ending NAFTA. Textile exports would go down to 47.7% and the apparel and textile manufacturing industry in the US is expected to decrease from $1,923 million to $308 million.President Trump is looking to “Make America Great Again” but is not taking into account that overseas production is what helps the U.S. economy flowing due to the cheaper production costs. Regarding your last point “Make America Great Again” but is not taking into account that overseas production is what helps the U.S. economy flowing due to the cheaper production costs.”, how is it relevant to the NAFTA? Can you explain more? I agree with you professor Lu that removing ourselves from NAFTA will hurt the U.S. It is clear based on the findings indicated within this blog post, that withdrawing from our long-standing trade agreement between the North American countries will have a negative impact on our economy, industry and the consumer. As you explained, it will be harmful to U.S textile exports, reduce apparel imports and dissolve the U.S of some of its apparel manufacturing. This is in opposition of what President Trump wanted for “bringing back jobs to the U.S”. It makes absolutely no sense for us to withdraw from NAFTA. I believe that our government and trade policy makers should make some updates and adjustments to our already existing trade agreement. After taking this class, I have an even greater understanding of how critical Donald Trump’s decision to one day leave NAFTA is to America and the rest of the industry. However, I also greatly learned that while it can be very harmful to the USA, it will be even more detrimental to other countries. For example, by us pulling out of the trade agreement, Mexico’s economy could be majorly affected. Their exports will decrease and jobs could be lost. Overall, by us pulling out of NAFTA it could affect many others. I find this article to be quite alarming. After reading this I am confused as to why Trump would want to remove NAFTA. With global trade agreements, it is important to see how each agreement affects every country it is involved with. In my opinion, Trump seems to be very set on only looking out for whatever is in the best interest of the U.S..While he is now President, and should be looking out for the U.S., he should also realize that removing this will not only hurt our own economy but Mexico and Canada as well. This could ruin our relationship with them in the future, and honestly, nothing good will come from the removal of it. In my opinion, the NAFTA should be left as is, or else Trump will do exactly the opposite of what he intends to do. One thing we’ve learned in FASH455 is the importance of “comparative advantage.” It simply does not make sense economically for the United States to bring apparel manufacturing jobs back, as we can put our time, resources, and energy into manufacturing more capital-intensive products that other countries simply cannot produce. Additionally, it would take time to create these new manufacturing jobs, and the U.S. would be losing out on money and trade during this time period. NAFTA does more good for our economy than bad and promotes the economy of other member countries as well, thus promoting a greater global economy. Trump needs to consider the concept of comparative advantage, as well as considering the effect that pulling out of NAFTA will have on the economies of other countries involved. The goal of Trump is for ‘Buy American,’ he wants to create the best economy for our country. The issue in that is that getting rid FTA such as NAFTA destroys the relationships that we have with those countries. If we continue to close off trade agreements we eventually will be closed off to the entire world and at that point how will that benefit our own economy. I have very strong views on our current POTUS, and was nervous about what was to come of NAFTA. After campaigning on the platform that it’s obsolete and one of the worst trade deal in history, he has changed his mind and decided to keep it. I understand that NAFTA is dated and needs to be updated and renegotiated. Getting rid of NAFTA completely would not be a very smart move for the US. With the current global supply chain, pulling out of NAFTA would leave us behind in world trade benefits. 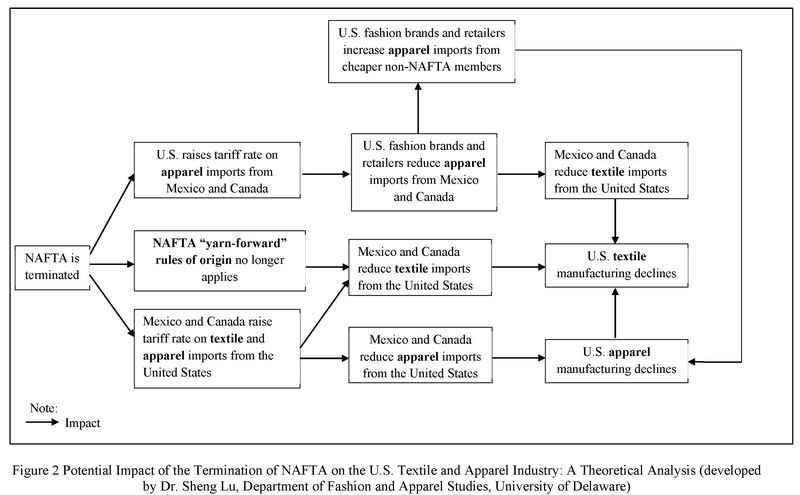 Until I took this class, I had no idea how large of an impact NAFTA had on the US Textile Industry. Ending NAFTA is going to have some grave consequences on this particular industry. The volume and apparel manufacturing is going to significantly decrease, despite Trump saying that NAFTA was “very very bad” and the worst trade deal of all time. If we look closely at figure 3, we can see that this decrease is certain and scary for the textile industry. It is clear that Donald Trump has a mindset that exiting NAFTA will bring back the made in America stamp. However, this is not the case. I agree that exiting NAFTA will greatly affect the US in a negative way. We export so much to Mexico which is an important factor to have. You can see from figure 3 that the effects of leaving NAFTA will only cause harm to our country. Trumps plan is going to be something that is very hard to accomplish especially considering 99% of our apparel is made elsewhere. Instead of focusing on bringing things back here we need to invest our money for the capital and resources of manufacturing companies in China or Vietnam where our clothes are already being produced. We should also invest time into creating stronger relationships with these manufacturers. What is interesting to me is That Trump wanted to withdraw from Nafta in the first place. All of the evidence in this article showed clearly the harmful effects that would take place with the U.S withdrawing from NAFTA. Trump soon realized thankfully that withdrawing from NAFTA would intact hurt the U.S more than help it. What conclusions finally brought him to this realization? Ending NAFTA will create problems for both the importing and exporting of textiles and apparel. For one, the annual U.S. textile exports to Mexico and Canada will sharply decline by $2,081 million, which will in turn hurt the US economy more then help it. What I find interesting is that if it will only hurt importing textiles with the NAFTA region, why wouldn’t companies just start importing from other countries like Vietnam and Bangladesh? I am curious to see if without NAFTA, Trump will then go to raise trade barriers with other countries outside the NAFTA region, to incentivize manufacturing in America. From this article, it seems that without NAFTA, companies will just trade more with other countries in Asia, which will in turn help their economy and hurt Mexico’s. I think Trump needs to think about not only America’s economy, but the rest of the world’s economy as well, since a lot of developing countries depend on trading with the US’s textile and apparel industry. good thoughts… Regarding your questions– Currently, many US fashion brands and retailers benefit from the preferential duty treatments provided by NAFTA. The saved duty rate can be as high as 30% for certain apparel products. Understandably, these companies don’t want to lose the benefits. Similarly, without NAFTA, US textile exports to Mexico and Canada will face an increase of tariff rate too. This will make US products less price competitive in the Mexican and Canadian markets. Even worse, without NAFTA, there will be much less incentives for Mexico and Canada to use US made yarns and fabrics in their apparel. Regarding Trump’s intention to terminate NAFTA–it is in his strong belief that NAFTA contributes to the enlarged US trade deficit and hurt those import competing sectors in the US. Trump’s view is more in line with the mercantilist view on trade. 1. Why do many jobs in the US textile industry disappear after NAFTA comes into effect? 2. Who is the beneficiary in this transition? Who is the loser? With your perception, do you think it would be better if we protect vulnerable industries like textiles or we let it heal itself after the trade agreements themselves due to effect? What are the benefits of this protection? What are the costs? Please answer the question above help me!